A few weeks ago I went to Anguilla to check in on one of my projects. The build is going very well. When I think of the mood for a beach house, the first thing that comes to mind is relaxation. I’ve been looking at books in my library and pulling images from the internet for inspiration. The bathrooms don’t have to be from a Caribbean beach house but must have some elements that would work in that environment. There are many decisions that have to be made. What kind of finishes? What color? If we use tile, what size? While this is a house in Anguilla, the style will not be British Colonial. It’s too formal for a beach house. There will be touches (like a mahogany four-poster bed) of course but mixed with a contemporary spin on Caribbean design. This bathroom is from a home on the tiny Island of Mustique. I love the natural feel of it. We’re already using poured cement for the kitchen counter tops. To use it again in the bathrooms might be too much. This large en-suite bathroom in a Sicilian villa has a stone sink. 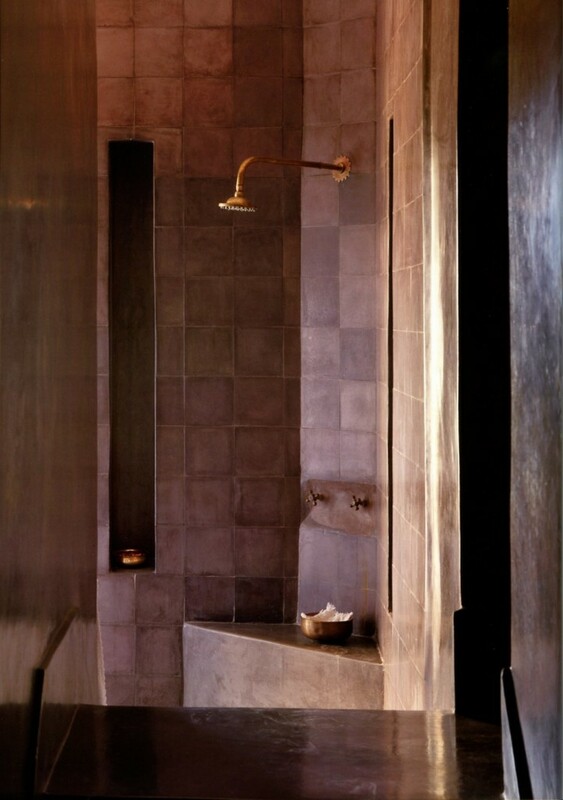 Love the simplicity of the shower stall and the use of wooden stools. This is a newish boutique hotel. I must see Rocca delle Tra Contrade in person. The photos are stunning. I’m not a fan of shower caddies. Our clients for the Tuscany project were very clear that they wanted built-in spaces for shampoo, soap, etc. If it’s early enough in the build/renovation, I recommend going in this direction. Just make sure there’s a slight slope, so water doesn’t pool in the space. A partial wall works for this project. It never gets cold. 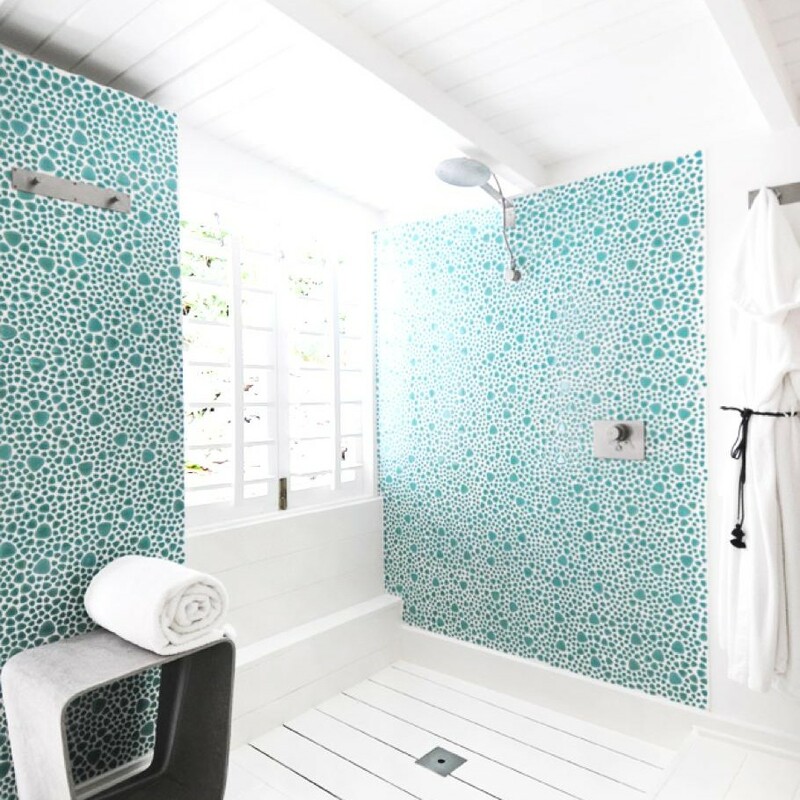 Getting away from the neutrals for a minute, this bathroom from the La Banane hotel on St. Barths is very bright and colorful. 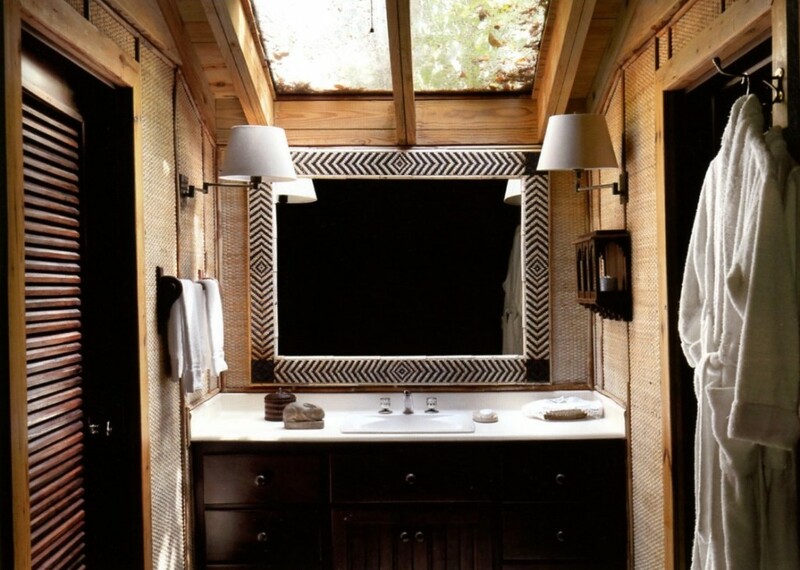 A fun design like this might be a great idea for one of the smaller bathrooms. Or the powder room. In a large space this color and pattern would be not be relaxing to me. 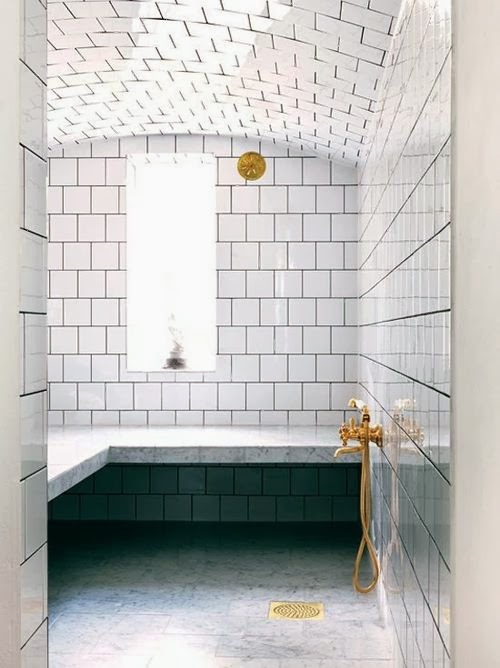 Brass fixtures are having a moment. I like them in this bathroom. I look at all this tile and worry about cleaning the grout. I LOVE outdoor showers. The ones at Cap Juluca in Anguilla are fantastic. A more traditional style at Oscar de la Renta’s former home in the Dominican Republic. A shower in Marrakesh. Fantastic built-in bench. 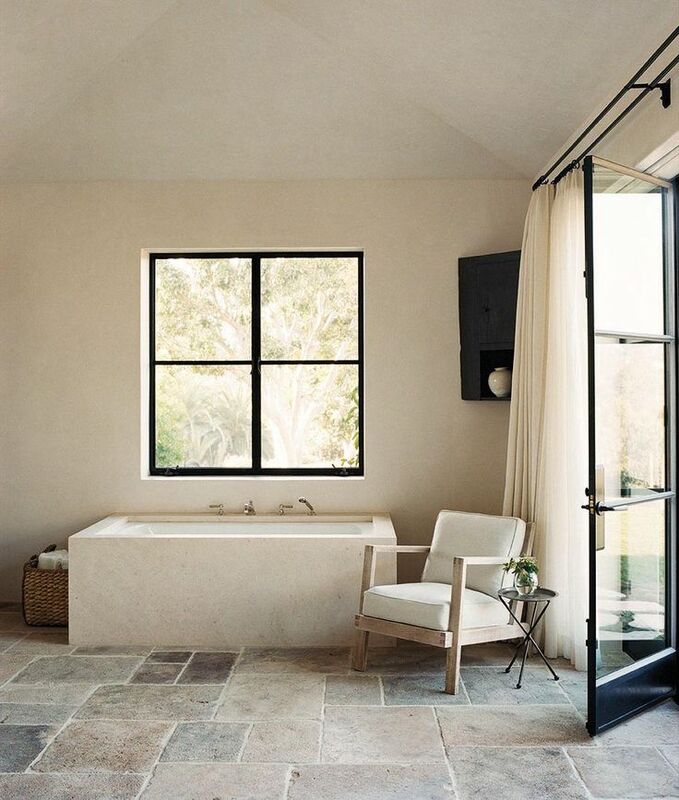 I don’t know where this house is but I like the contrast of the stone-tiled floor with the black contemporary trim on the windows and with the lines of the tub. 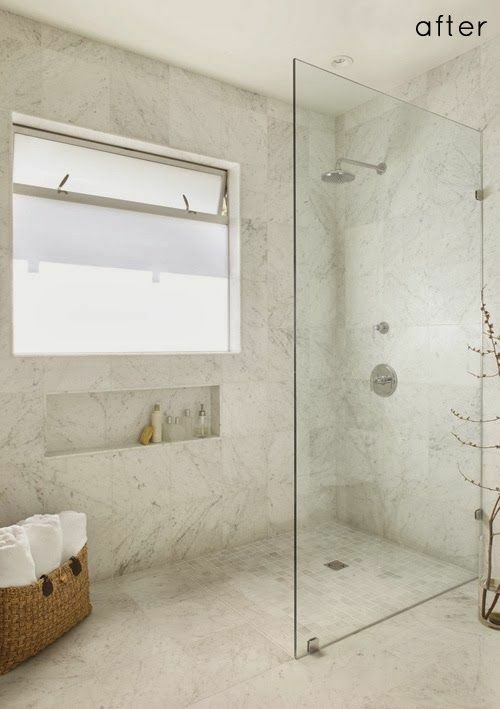 Yes x 1000 to built-in shower nooks! I wish I had one in my current shower.